Scott Judd trained his camera lens on the white dot in the distance. As he moved up the Lake Michigan shoreline, the speck on a breakwater came into view and took his breath away: it was a snowy owl, thousands of miles from its Arctic home. But for researchers, this winter’s mass migration of the owls from their breeding grounds above the Arctic Circle is serious business. It’s a chance to trap and fit some of the visitors with tiny transmitters to help track them around the globe and study a long-misunderstood species whose numbers likely are far fewer than previously thought, researchers say. “There is still a lot that we don’t know about them … but we aim to answer the questions in the next few years,” said Canadian biologist Jean-Francois Therrien, a senior researcher at Hawk Mountain Sanctuary in Pennsylvania. The solar-powered transmitters can last for years, collecting information such as latitude, longitude, flight speed and air temperature that is downloaded to a server when the birds fly into range of a cell tower. The use of transmitters, which intensified during the last North American mass migration in winter 2013-14, already has yielded big surprises. Instead of 300,000 snowy owls worldwide, as long believed, researchers say the population likely is closer to 30,000 or fewer. The previous estimate was based on how many might be able to breed in a given area. That calculation was made assuming snowy owls acted like other birds, favoring fixed nesting and wintering sites. But researchers discovered the owls are nomads, often nesting or wintering thousands of miles from previous locations. The miscalculation doesn’t necessarily mean snowy owls, which can grow to about 2 feet long with 5-foot wingspans, are in decline. Scientists simply don’t know because they never had an accurate starting point. This month, snowy owls were listed as vulnerable—one step away from endangered—by the International Union for Conservation of Nature. They’re protected in the U.S. under the Migratory Bird Act. This year’s mass migration is a bit of good news. Researchers once thought these so-called “irruptions” signaled a lack of prey in the Arctic, but now believe the opposite: Breeding owls feed on lemmings, a rodent that lives under Arctic snowpack and whose population surges about every three or four years. More lemmings means the owl population explodes— and that more birds than usual will winter in places people can see them. But researchers worry that climate change will affect the owl population because lemmings are exceptionally sensitive to even small temperature changes. Lemmings “depend on deep, fluffy, thick layers of insulating snow” to breed successfully, said Scott Weidensaul, director at Project SNOWstorm, an owl-tracking group whose volunteers have put transmitters on more than 50 snowy owls in the past four years . The snowy owl population collapsed in Norway and Sweden in the mid-1990s, all but vanishing there for almost two decades before reappearing at lower numbers, experts said. In Greenland, where the population collapsed in the late 1990s, researchers found a few nests in 2011 and 2012 after six years with no recorded nests, but owls didn’t come back in 2016 or 2017, when lemmings should have been peaking. The National Oceanic and Atmospheric Administration reported this month that the far northern Arctic is warming twice as fast as the rest of the globe. But it’s tough to assess lemming population trends in remote areas. Although researchers hope to enlist native villagers to help, it’s mostly up to owls with transmitters for now. Snowy owls somehow seem to find lemmings even if they are thousands of miles from where their population last peaked, Therrien said. Norman Smith, a snowy owl expert with Mass Audubon in Massachusetts, said he’s heartened that many independent researchers worldwide joined forces to share information on snowy owls. “It’s amazing what we’ve learned, but we need a bigger database of birds,” said Smith, who has been trapping owls at Boston’s Logan International Airport for more than 35 years and fits them with a leg band or transmitter before letting them go. He put a satellite tracker on an owl for the first time in 2000, proving that they could make it back to the Arctic. Last week, Smith released a young female on a barrier beach along the Atlantic Ocean. It flew south, then circled back and flew overhead. As he drove over a bridge to the mainland, the owl was sitting on a post, surveying its new winter home. This entry was posted in 2017, International and tagged owls, population on 30 Dec, 2017 by Birdlife20 owner. Inspiration from owls’ wings could allow aircraft and wind turbines to become quieter, suggests a new study. Researchers studied the serrations in the leading edge of owls’ wings, gaining new insight into how they work to make the birds’ flight silent. Their results point towards potential mechanisms for noise suppression in wind turbines, aircraft, multi-rotor drones and other machines. A new study has revealed how inspiration from owls’ wings could allow aircraft and wind turbines to become quieter. Researchers from Japan and China studied the serrations in the leading edge of owls’ wings, gaining new insight into how they work to make the birds’ flight silent. Their results, published in the journal Bioinspiration and Biomimetics, point towards potential mechanisms for noise suppression in wind turbines, aircraft, multi-rotor drones and other machines. 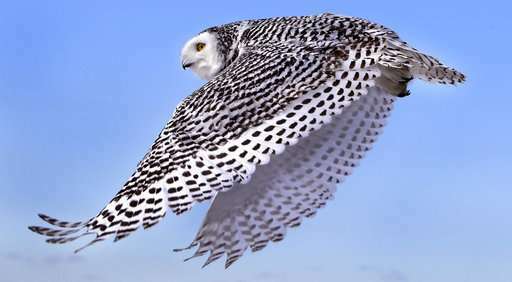 Lead author Professor Hao Liu, from Chiba University, Japan, said: “Owls are known for silent flight, owing to their unique wing features, which are normally characterised by leading-edge serrations, trailing-edge fringes and velvet-like surfaces. The researchers analysed owl-inspired feather wing models with and without leading edge serrations, by combining large-eddy simulations — a mathematical model for turbulence used in computational fluid dynamics to simulate air flows — and Particle-Image Velocimetry (PIV) and force measurements in a low-speed wind tunnel. They discovered leading-edge serrations can passively control the transition between laminar, or streamline air flow, and turbulent air flow over the upper wing surface, at angles of attack (AoA) between zero and 20 degrees. This means they play a crucial role in aerodynamic force and sound production. Professor Liu said: “We found, however, that a trade-off exists between force production and sound suppression. Serrated leading-edges reduce aerodynamic performance at lower AoAs than 15° compared to clean leading-edges, but can achieve noise reduction and aerodynamic performance at AoAs above 15°, which owl wings often reach in flight. “These owl-inspired leading edge serrations, if applied to wind turbine blades, aircraft wings or drone rotors, could provide a useful biomimetic design for flow control and noise reduction. 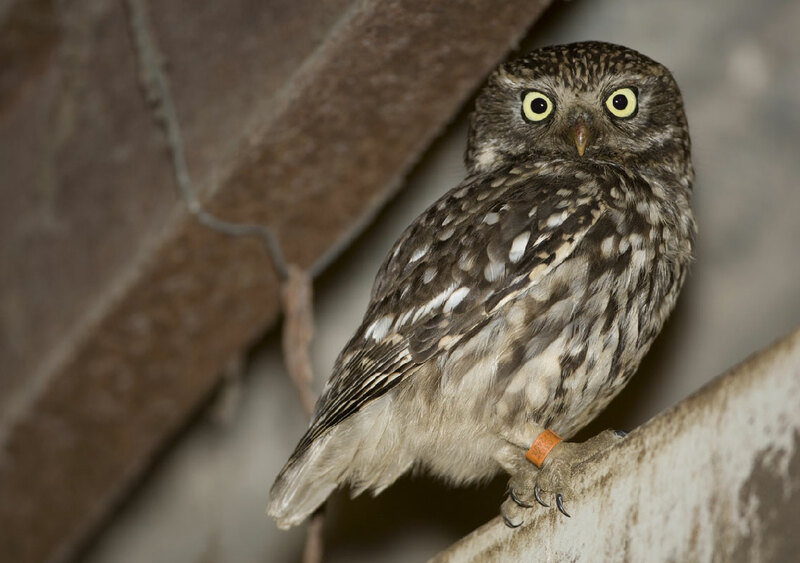 This entry was posted in 2017, International, X and tagged owls, study on 5 Jul, 2017 by Birdlife20 owner. The National Park Service’s Stephanie Eyes (formerly of Humboldt State University) and her colleagues wanted to know how Spotted Owl foraging patterns are influenced by fire severity and fire-created edges, with the goal of informing future fuels reduction efforts and prescribed burning programs. They used radio-transmitters to track movements of 13 owls on eight territories in Yosemite National Park between 2010 and 2012 and found that overall, owls foraged near their roosts and along the edges of patches of burned forest, preferring these edge habitats. Owls selected larger burned patches than the average available size but avoided the interiors of severely burned patches. “Maintaining a complex mosaic of forest patches with smaller patches of high severity fire can help sustain California Spotted Owls in the greater landscape,” says Eyes. “What’s unique about our study is that we investigated fires that burned within the natural range of variation, so it paints a picture of how owls used a burned landscape before the onset of today’s large stand-replacing fires.” Despite the owls’ preference for edges, there may be a threshold over which edges have a negative effect on habitat quality, and more research is needed to find the right balance between beneficial edge habitat and potentially harmful habitat fragmentation. This entry was posted in 2017, International, X and tagged habitat, owls, study on 3 Jun, 2017 by Birdlife20 owner. De to ugleunger fra DOF’s UgleTV er forsvundet i nattens mulm og mørke, dræbt for åben skærm. Se, hvad der skete i den unikke video og læs mere om kampen mellem to af Danmarks top-rovdyr. Dramaet har ingen skurk, men er en del af naturen, mener DOF. DOF’s webkameraer fra fuglenes verden leverer endnu engang enestående og utrolige billeder af et vildt drama i den danske natur. DOF’s ugleekspert, Klaus Dichmann, er trist over de to ugleungers skæbne, men synes også, det er spændende for første gang at kunne se sådan et drama fra uglernes hemmelige liv i nattemørket. – Det er hårdt og brutalt at se en ræv bide ugleungerne ihjel for åben skærm. Samtidig er det fantastisk spændende, at DOF’s UgleTV kan vise optagelserne af, hvad der foregår af drama i naturen. På den måde bliver vi alle klogere på naturen, og det er jo meningen med DOF’s ugletv og andre webkameraer, siger Klaus Dichmann, der er formand for Uglegruppen i Dansk Ornitologisk Forening, DOF. Biolog og naturpolitisk medarbejder i DOF’s Naturafdeling, Knud Flensted, medgiver, at det kan være hårdt at se på, at ræven tager ungerne, men han understreger, at ræven blot gør det, den skal, for at opfostre sine egne unger. – Der er ingen grund til at udnævne ræven som skurk på grund af det her. Det er naturens gang, og ugle-ungerne er formentlig endt som føde til rævens hvalpe. Ræven tager det bytte, den skal bruge, for at opfostre de hvalpe, den har her i maj måned, og det er helt, som det skal være i naturens fødekæde, siger han. This entry was posted in 2017, Scandinavian, X and tagged owls on 9 May, 2017 by Birdlife20 owner. Med flere redekasser og flere fritidslandbrug er der stadig håb for den truede kirkeugle i Danmark. Det vurderer tyske uglespecialister fra Landesverband Eulen-Schutz in Schleswig-Holstein, skriver bladet Fugle & Natur. – Hvis kirkeuglen vil forsvinde, så skal vi i hvert fald gøre det så besværligt for den, som vi overhovedet kan, som Klaus Dichmann, formand for DOF’s uglegruppe, udtrykker det med et glimt i øjet. Han har fået lidt af optimismen tilbage efter et besøg fra tyske ugleeksperter sidste år. Tre ornitologer fra den tyske uglegruppe i Schleswig-Holstein besøgte de områder i Himmerland, hvor der stadig yngler måske 10-15 par kirkeugler. Tyskerne kommer selv fra et område kun et halvt hundrede kilometer syd for grænsen, hvor der er en stabil bestand af kirkeugler på omkring 60 par. De konkluderer i deres rapport om besøget, at kirkeuglen stadig har en chance i Danmark, hvis der nu sker en målrettet opsætning af redekasser på de landejendomme, som egner sig til kirkeuglen. – Der er ikke føde nok til kirkeuglerne i det effektivt drevne landbrug. Men også i Himmerland flytter flere mennesker fra byerne nu ud på landet i nedlagte landejendomme, hvor de starter fritidslandbrug med fritgående heste, får eller kødkvæg i indhegninger omkring gårdens bygninger. Det er præcis den form for landbrug, som giver et varieret fødegrundlag for kirkeuglerne, siger Klaus Dichmann. Kirkeuglerne spiser store insekter, regnorme, mus, padder og småfugle, som de fanger på jorden. Undersøgelser viser, at de sidste danske kirkeugler især søger føde lige omkring de bygninger, hvor de yngler. Styregruppen for ”Projekt Kirkeugle” i Himmerland er derfor i gang med at udpege velegnede ejendomme i nærheden af eksisterende uglepar. Hvis forholdene er uglevenlige og ejendommens ejere er indforstået, så sættes der kirkeuglekasser op, som forhåbentlig kan tiltrække unger fra uglepar i nærheden. – Vi forventer at sætte mindst 20 kasser op i år på nøje udvalgte ejendomme, og der er flere på vej, siger Klaus Dichmann. This entry was posted in 2017, Scandinavian, X and tagged owls, project on 30 Apr, 2017 by Birdlife20 owner. 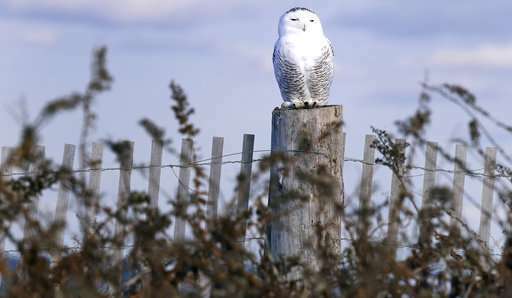 Every year Snowy Owls descend out of the Arctic, sometimes in smatterings, sometimes in mas­sive irruptions, to spend winter in south­ern Canada and the Lower 48 states. They pop up in odd places—hunkering down on haystacks in farm fields, just off the runways at airports, atop light poles in grocery store parking lots—to the de­light of birders and Harry Potter fans. It’s a popular myth that Snowy Owls are driven by starvation to fly south, and according to University of Sas­katchewan scientist Karen Wiebe, it’s generally not true. In August Wiebe and her graduate student Alexander Chang published research that showed Snowy Owls wintering in southern Canada ap­peared to be doing just fine. They found that the average body mass of a wild adult Snowy Owl was 73 percent above the emaciation threshold. Indeed, many of the owls actually put on weight over the winter by increasing their subcu­taneous fat stores (fat that accumulates under the skin on birds’ chests and beneath their wings and is used for both insula­tion and energy). Wiebe’s findings came from detailed data on the body condition of more than 500 wild Snowy Owls trapped and banded on the prairie near Saskatoon over more than a decade. But the data set wasn’t gathered by Wiebe. She bor­rowed it from Marten Stoffel and Dan Zazelenchuk, a pair of Saskatchewan owl-banders. This entry was posted in 2017, International, X and tagged owls, research on 7 Mar, 2017 by Birdlife20 owner. Lappugglan häckar vanligtvis i de norra delarna av Sverige. Men under vissa år när det finns gott om sork kan de häcka längre söderut i landet. De är svåra att få syn på eftersom de ofta har sina bon i täta granskogar. Men jag och en vän fick ett tips av en fågelskådare att det var en familj som hade ett bo i närheten av där vi bor i Närke. Många brukar säga att lappugglan är en tacksam fågel att fotografera. Den är i de flesta fall helt orädd för människor. Men tänk på att man inte ska gå för nära och respektera denna vackra fågel, även om den inte är rädd. Chansen är stor att häckningen påverkas negativt vid för mycket mänsklig kontakt. I denna artikel står vi alltid på behörigt avstånd med långa teleobjektiv. Mitt första möte med familjen blev en vacker kväll i maj. Den vuxna ugglan kom med en sork till de tre ungarna som fanns i boet. En av ungarna var mindre i storlek, vilket är mycket vanligt. Nästa dag blev vi otroligt förvånade, boet var tomt. Ungarna hade redan lämnat boet och det kändes som något var fel. De brukar nämligen tillbringa längre tid i boet. Men efter en stund hörde vi en av ungarna som satt synligt vid en stubbe. Efter ytterligare en stund hördes en unge till en bit bort i skogen. När det började skymma hade vi tyvärr bara hört två ungar. Den mindre av dem tre hade nog inte klarat sig, men hoppet fanns ännu kvar. This entry was posted in 2017, Local Swedish, X and tagged owls, treat on 23 Feb, 2017 by Birdlife20 owner.